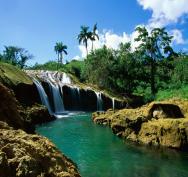 Trinidad de Cuba is situated in the province of Sancti Spiritus in central Cuba. Trinidad was declared a World Heritage site in the year 1988 along with the Valle de los Ingenios. There are some fine restaurants to dine in and lovely markets and shops to browse around to your heart's delight. The abundant nightlife is very varied from quieter bars to lively nightclubs. School info: No actual school building, classes held in cultural centre, instructor’s home or host family home. The Valle de los Ingenios also known as the Valley of the Sugar Mills is located approximately 7 miles from Trinidad de Cuba. It is 3 valleys that are all interconnected with one another and their names are Santa Rosa, San Luis and Meyer. During the late 18th century until the late 19th century the 3 valleys were actually the centre for the production of sugar. When the industry was at its highest peak there were approximately 50 sugar mills operating throughout the valleys. Trinidad de Cuba is a quaint and easy to navigate city with a very enviable setting sandwiched between the Sierra del Escambray and the Caribbean. There are numerous museums throughout Trinidad de Cuba including the Museo Nacional de la Lucha Contra Bandidos with its spectacular yellow bell tower from the days when the building used to be the convent of San Francisco de Asis. The building has housed the museum since the year 1986 and displays some wonderful exhibits of weapons, photos and maps. For some great shopping visit the open air arts and crafts market which takes place in front of the Casa de la Trova this is the perfect place to pick up some unusual souvenirs and gifts. For a lively night out try the Bar Daiquiri where you will discover the drinks are cheap and the fast food style menu is tasty.